Lock in a great price for Villa Eugénie – rated 9.9 by recent guests! One of our best sellers in Gustavia! Villa Eugénie is located in Gustavia and offers barbecue facilities. Guests staying at this villa can use the terrace. The villa is located on the ground floor and features 2 bedrooms, a flat-screen TV with satellite channels and a fully equipped kitchen that provides guests with a dishwasher and an oven. The villa also includes a seating area and a bathroom with a hot tub. Guests can use the hot tub. Guests can relax in the garden at the property. When would you like to stay at Villa Eugénie? This villa has a kitchenware, cable TV and electric kettle. 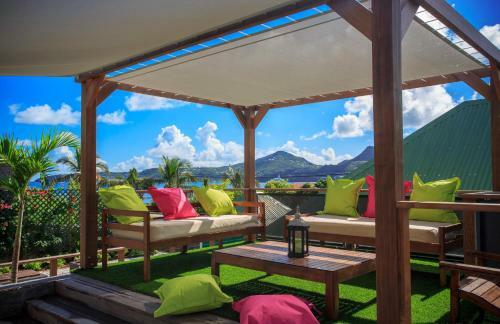 Located in the Caribbean, on the famous island of St. Barts, Villa Eugenie is a charming 2 bedroom house. The modernity of its equipment perfectly matches its architecture typical of Saint Barth. Thus, the spa and the tropical garden join the old world charm of the Villa. Ideally located in the bay of Anse des Cayes, calmness of the sea will make you dive into this paradise setting. 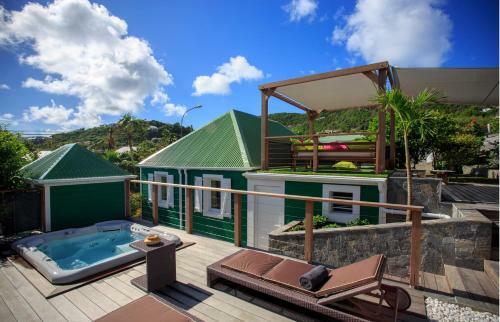 It is also close to the tourist attractions of St Jean and the marina of Gustavia. Villa Eugenie Creole design promises you an unforgettable stay in Saint Barth. House Rules Villa Eugénie takes special requests – add in the next step! A EUR500 damage deposit is required 7 days before arrival (about USD562.17). This deposit will be fully refunded 7 days after check-out, as long as there isn't any damage to the property. Please inform Villa Eugénie of your expected arrival time in advance. You can use the Special Requests box when booking, or contact the property directly using the contact details in your confirmation. A damage deposit of EUR 500 is required. The host charges this 7 days before arrival. That's about 562.17USD. This will be collected by bank transfer. You should be reimbursed within 7 days of check-out. Your deposit will be refunded in full by bank transfer, subject to an inspection of the property. The kidness of owners:Laurent,Laurence and Axel,the position,the house and garden design...everything was Amazing!!! Everything. It is the most beautiful location we have ever been to. The people are very nice as well!